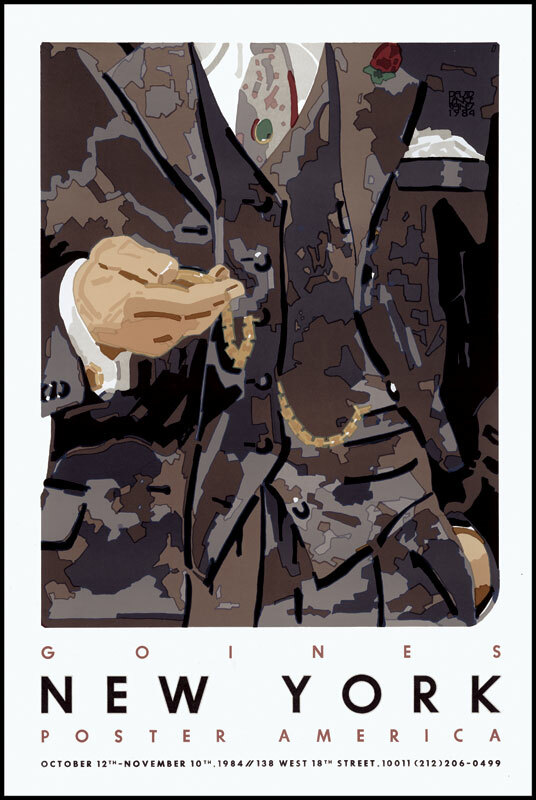 Goines show at the gallery Poster America. Edition of 2967 of which 300 are signed 1-300, 26 are signed A-Z as artist's proofs, and three sets are signed as progressives. October 1, 1984 19 colors 16" x 24"
Lately, I've experienced an odd sensation of the passage of time combined with a distinct inkling of mortality. Not unpleasant, but definite. Every time I turn on the microwave to nuke something (great for saké, oatmeal and reheating stew) the backward countdown on the display proclaims a certain, sure elapse of 45 seconds, or a minute, or three minutes of my life, never to be seen again. As I watch the counter measuring my seconds as well as those needed to re-heat the soup I think, "Someday, only 45 seconds will be left of my life, and they will elapse, just as now, and then that will be the end of it." In tandem with this is the date stamps on food that I get at the grocery store: "Good until February 18, 1994." Not only do I get from this a sense of the gentle, inexorable, irresistible passage of time, but even more than that, the sharp impression that this date will come no matter what. Whether I'm here or not, it will come.